Our largest and most well appointed cottage, this traiditional yeoman farmer’s house is the ultimate country get-away complete with log-burning stove. An attractive barn converted from the old cow milking barn. One floor with open-plan vaulted ceiling sitting/dining room and kitchen. One end of the old threshing barn converted into a one-bedroom cottage with open-plan living area with vaulted ceiling. Perfect for couples. Barn conversion on one level with own garden and barbecue area. Open-plan living space, one double and one bunk bed room. 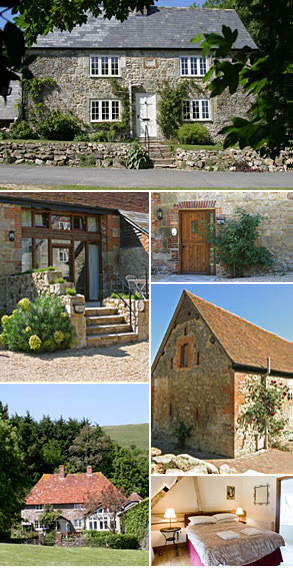 A 4* luxury cottage lovingly converted from the old mill in 2007. Two en-suite doubles and one twin room. Large living, kitchen and dining areas. A 4* luxury property with en-suite double and twin room. Spacious open-plan living area. Converted from 19th C barn in 2007. Part of Mersley farmhouse, the Farmhouse Cottage is a perfect space for couples. Our beautiful yurts were handmade on the Island and sleep up to four people in each.